Please tell me the personalization here. Please see the listing description for guidelines. This men's tie clip measures 2 x 1/4 inches across and is made from thick 20 gauge sterling silver sheet that I hand saw, fine and personalize just for you. 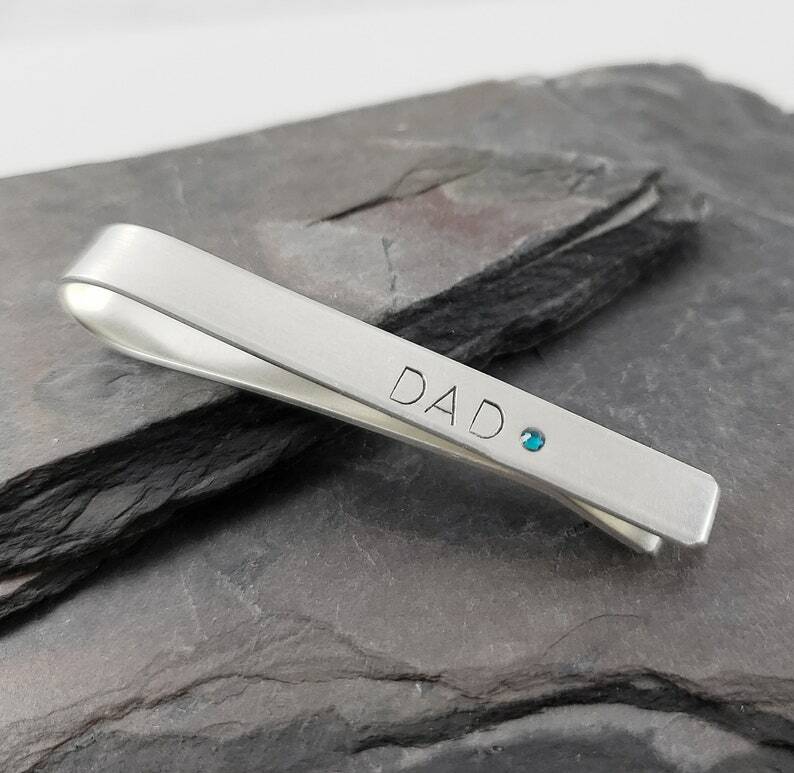 It can have up to 7 uppercase 3mm letters and/or Swarovski birthstone crystals. This can also be personalized on the back as well with up to 7 uppercase characters. (No birthstones on the back) The font used is the one shown, Ariel font, I can use uppercase letters or numbers only. You can add the amount of Swarovski crystals to your order by using the drop down menu. Please remember that you are allowed 7 total characters and/or crystals total on the front of the tie bar, and up to 7 letters on the back. Spaces count as characters. This would make a great father's or grandfather's gift. Or choose a crystal that matches the wedding colors for your groomsmen! These take a few days to make so please plan accordingly. Let me know any personalization you would like in the field provided or the "Note to seller" box during the checkout process but also remember the character and crystal limit stated above.